Through June 22, the Wendt Gallery in Midtown Manhattan is host to one of the more beautiful and intriguing shows of contemporary paintings you will find in the borough that is also its muse. 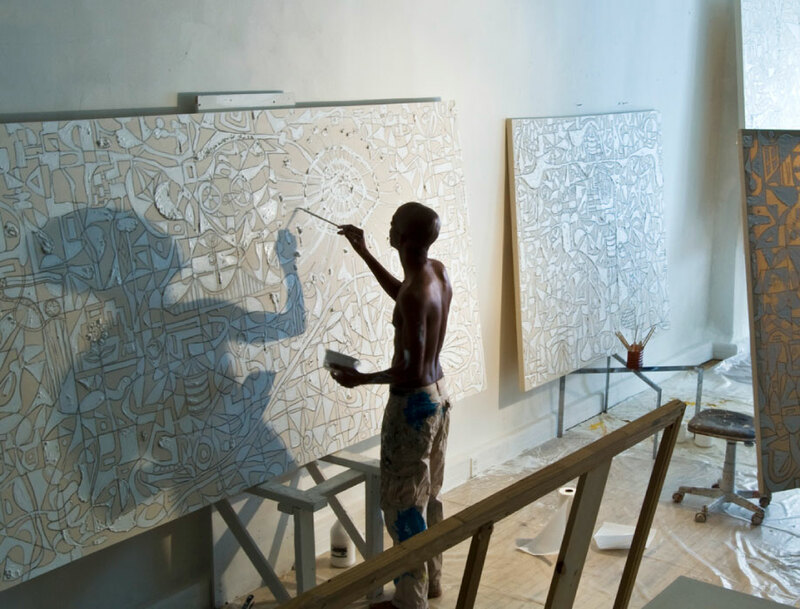 Alter Ego Paintings brings together a series of large-scale canvases and smaller pastels by Victor Matthews, an artist who has been living and producing in Manhattan since the mid-’80s, alongside Warhol, Keith Haring, Basquiat, Kenny Scharf, and Clemente. The serenity and active simplicity of the paintings suggest not only Matthews’s rich artistic partnership with New York, but the way in which we all seek to be on intimate terms with the places we live in — especially this blaring and shaking city that keeps trying to re-make itself into something else. On a visual level there is a rightness to the way Matthews is using space that is unmistakable, an invisibly constructed symmetry and balance. The paintings have a Modernist sensibility. Set on a palate of white, the interplay between the textures of paint and the treated, raw-colored canvas is a harmonious and shifting affair, demarcated by a strong presence of the two-dimensional — of line. This is where the works begin, with an unchangeable, fluid drawing in wax pencil that is both conceived and created in the same moment. The artist doesn’t do studies, relying instead on a second-sense for both the beauty and the infinite possibilities in the bisecting of space. As Brice Marden has observed, Victor Matthews has “the line”.